Way back in January of 2008 when Ray and I began the process of looking for a wedding location, I had no idea where we would have it or what it would look like, our only preference was that it be outdoors. We were so excited when we found The Laguna Cliffs Resort in Dana Point, California, a beautiful spot overlooking the ocean where we could have both our wedding and our reception. 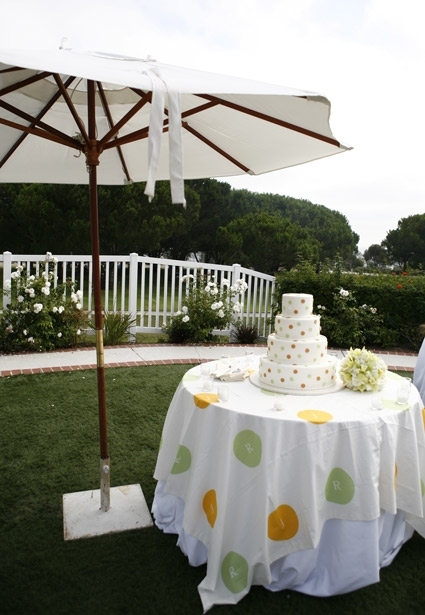 The standard setting at Dana Point is all white chairs, table cloths and market umbrellas, giving us total flexibility to create a wedding that reflected our style: colorful and sunny with a handmade touch. There was no question that we would somehow make use of the fabrics we sell at purlsoho.com and so we began the process of considering colors and prints that would work for us. 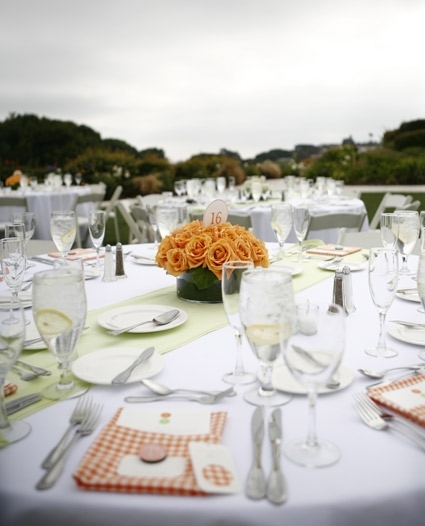 For the reception we decided to make cloth napkins, each table featuring a different print in varying shades of sherbet orange and citrus green. In April I started collecting prints in earnest, but even though I am surrounded by fabrics in almost every color and style at our warehouse, it was actually a bit challenging to collect enough prints that all worked together. Every time a new shipment of fabric would arrive at our warehouse I would rush to open the boxes as if they contained a hidden treasure! Once I had enough prints I turned to Molly’s Simple + Spooky Cocktail Napkins Project Journal for guidance on an easy method for finishing the sides. My friend and co-worker, Mari and I pre-cut the fabrics into 19-inch squares with a 3/4-inch right angle triangle cut from each corner and shipped them off to friends and family who had enlisted to help sew them up. About a month later as they were all being shipped back to me, I realized that after the wedding we would be buried in orange and green napkins if I didn’t figure out what to do with them! At the end of the reception, I was surprised and relieved to discover that many guests wanted to take their napkins home as a memento. I’ve always wanted to make something from Joelle’s book Last-Minute Patchwork + Quilted Gifts, and have been told by many that the Color Wheel Quilt was quick and easy to make, so I quickly decided to make my own version of this quilt, The Wedding Wheel Quilt. I was lucky enough to have Joelle visit me in November (so the quilt was even more quick and easy to make!) and we made the whole thing in one day. Happily, we were left with enough napkins to make the top of this very special quilt. We used our custom printed fabric from Spoonflower from our cake table for the back, and we even had a few (clean!) Kona Cotton Mint table runners after the reception that became the binding for the quilt. 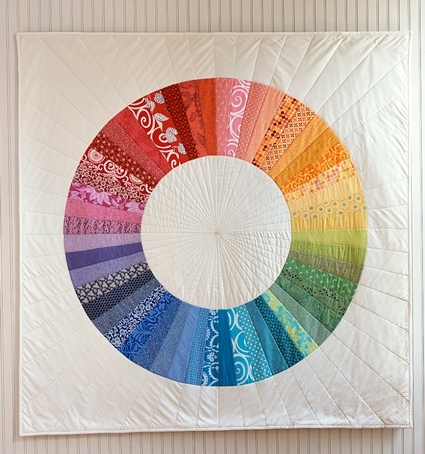 While our Wedding Wheel Quilt is one of a kind many of our readers have used our pre-cut Color Wheel Quilt Bundle to make their own Color Wheel Quilt. The Color Wheel Quilt Bundle contains a complete spectrum of 52 fat-eighths, enough to make the wheel portion of two Color Wheel Quilts (if you cut very carefully) or the quilt and a few other small projects. The photos of the wedding included in this story are from our wonderful photographer and friend, Eva Ng and we’re also very excited to share that you can see more photos from our wedding in the Winter 2009 Issue of Martha Stewart Weddings which will be available everywhere on December 29th! You can see more of our wedding on the Martha Stewart Wedding blog “The Bride’s Guide” by Darcy Miller at this link. Truly inspired. Makes me want to get married all over again just so I can completely copy your beautiful idea. 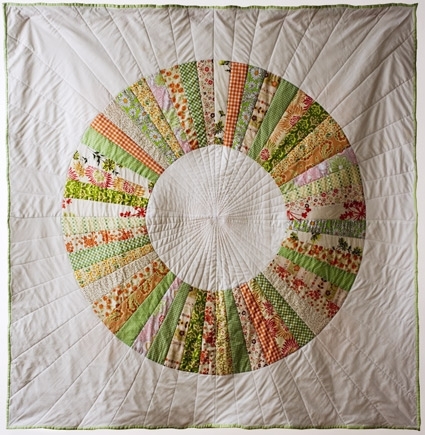 What a fantastic idea to have the quilt as a lasting memento. It looks lovely. What a wonderful story… That’s one special quilt indeed! I love it! A beautiful quilt and way to keep your memories. Congratulations and best wishes on the occasion of your lovely wedding. You have made some beautiful memories of your first special day as a newly married couple. Everythign you are showing us here is beautiful. I love the wedding, I love the quilts. Just beautiful. LOVE all the ideas you used! I made the color wheel quilt some months ago… still need to have it quilted and hang it up in my living room – such a great pattern! by far, my favorite post ever on Purlbee! Congrats on the wedding! It’s a lovely quilt and future heirloom for sure! What a lovely wedding colour scheme. So fresh and happy looking! Great inspiration to ! 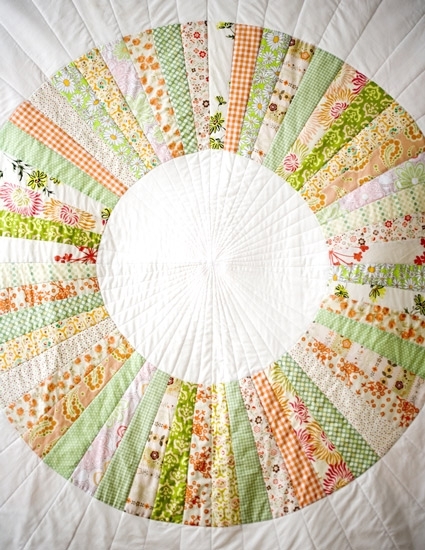 I love that eternal circle of love quilt. I think I must make one for someone special. I love seeing it all finished.. it makes me so happy. It’s a beautiful quilt from a beautiful wedding for a beautiful couple. I’m so glad I got to be a part of it! Gorgeous! Congrats on your wedding. That hotel looks great. thank you everyone for all your lovely comments on our wedding, the quilt and the well wishes! The napkins and quilt are lovely. What a great story and a great way to make something simple, beautiful and meaningful. This is one of Purlbee’s best entries – I agree! I went to the bookstore today just to look at the wedding issue! Looks like a lovely wedding, of course. I admire how well everything was thought out and put together. Congratulations! What a treasure. Wishing you happiness always. Truly amazing! Looks soo complicated to make. Absolutely gorgeous! A great inspiration for my own wedding planning! I was so pleased to see this post – simply lovely. Thanks, and congrats! What a beautiful wedding, and I LOVE that wheel quilt. Do I have a new years project brewing? 🙂 Congrats! That quilt is beautiful! I love how clean and simple it is — and what a wonderful idea to use fabric from your wedding! 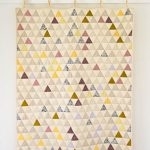 You’ve just inspired me to try quilt-making again. 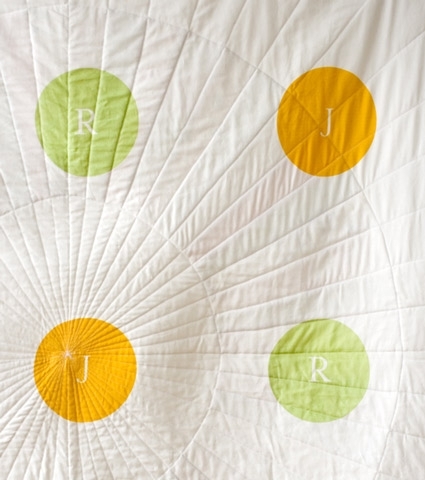 I love that the quilt is made almost entirely from repurposed material used in your wedding. Rather than have a bunch of napkins, table runners, and tablecloths in a box (items you might not have had opportunity to use again), you now have this beautiful keepsake quilt made from all of those things. Far more interesting, unique, and fun to reminisce over! You can look at the quilt through the years and say "Remember how we had this fabric made to match our cake?" "Remember, this green binding fabric was from the table runners?" 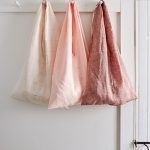 "Remember, I was so excited to find this particular fabric for the napkins, it matched the other fabrics so perfectly." Very beautiful! I did a similar wheel patchwork design last year for my bag but it took me months to finidh it! From choosing of fabric design to sewing to quilting, so much work but satisfying! …..wonderful post…lovely wedding….and now I know about Spoonflower.com! Yikes! What a fabulous resource! Loved your quilt. We had a young woman show up at our quilters group last spring wanting help with her first quilt. It was to be a gift for her sister and the fabric was the tablecloths that were used in her sister’s wedding. It turned out great too, and was very special present to her sister and brother-in-law. I don’t usually comment but I have to regarding this. 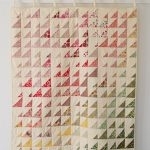 This is without a doubt THE most wonderful, special, fantastic idea for both a quilt and a wedding memento!! What a beautiful treasure! Thank you so much for sharing this lovely idea with us. I’m going to do the same for my daughter – if she ever gets married :O) !!! Her love of my quilts (actually, quilts in general – it’s just that she can beg me out of mine), along with her love of creating something tangible to remember a special occassion by will make this project perfect!!! Thanks again. I wish you a lifetime of happiness!! So beautiful! 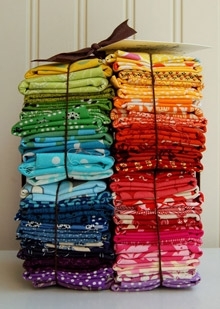 I absolutely love the idea of making the quilt out of the table linens! I wish I could steal your idea for my wedding this summer, but alas, I don’t think I have the budget for all the fabric…maybe if I stalk the Purl sale fabric 😉 ! Wow. Stumbled onto your blog (think I have stumbled here before, however…) Just beautiful. Love weddings. Bet you and your now spouse just adore cuddling under that quilt of love. This is one of the best wedding ideas I’ve ever seen. I loved planning my wedding and thinking outside the box for ideas, anything to make it feel like "our wedding" instead of any wedding. And this is definitely one of those ideas that makes me wish I’d known about it when we got married!! Wow! It all looks so pretty! Hi, Im brazilian and I went in Purl Soho Shop last week. I always visit your website. Its wonderful ! I traveled to NY with my husband and with Purl Sohoadress in my mind. Thanks for lovely sales clerk and congratulations for your book and shop. I bought "Last Minute…", in Brazil its very famous. I`m very happy because I could buy it in Purl Soho Shop. Sorry for my English !! Best Regards, Fabiana (and Rodrigo, my husband. He loved the shop, too !!). The quilt is just gorgeous. I love the colors so much. Question: in the zoomed up photo of the wheel, what are the 4th and 6th fabrics from the bottom?? I would love to get my hands on those! Looking forward to picking up a copy of MS weddings! What a beautiful quilt and one that holds memories of your friends and family on the special day! such an inspirations! Deserve to be at MS Wedding for sure! 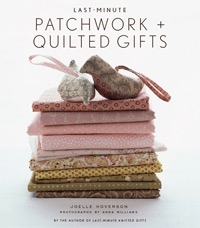 Love the idea of the quilt (although I can only knit right now… ) wish you all the best! This is a beautiful quilt and such a great way to remember your wedding. I really like the fabric you created for your cake table tablecloth. How many yards did you end up using to make the tablecloth? Did you use it all for the quilt backing? i had spoonflower ( http://www.spoonflower.com/welcome ) print 4 yards of the tablecloth fabric. I used all four yards for the table cloth but, probably didn’t need to as the tablecloth was folded under the table. i figured better safe than sorry as i didn’t know how tall the cake table would be! i only have a couple of strips of fabric left after making the quilt as i wasn’t concerned with being very careful to save any! 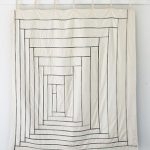 I would love to do this quilt but I am worried that the middle of it, where all the seams meet, will become a hard ‘lump’. Do you have any hints on how to avoid this? The middle of the quilt only has 4 real seams as the quilt is made in quadrants. The other seam lines crossing the center are just quilting lines and they don’t make a lump. I love this idea! 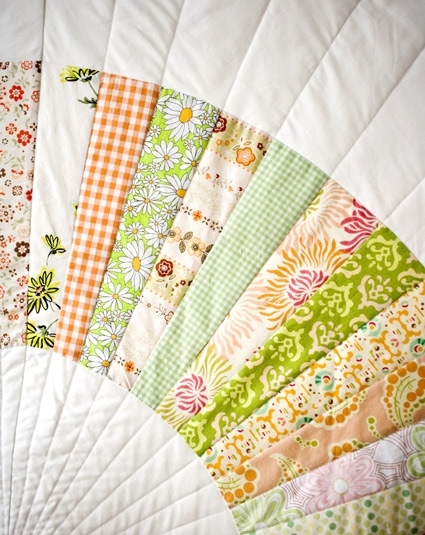 So when you made the quilt, did you pull apart the napkins to have two pieces of fabric again? Or did you use the whole napkin together. I’m just paranoid about it getting lumpy with the wheel. The napkins were single sided so Jen just cut from the inside to avoid the seams. The quilts are lovely. Reading from the comments you’ve got on your post, it seems that this will be an easy task to accomplish. We have to try this soon. Thanks for sharing this idea.